As most of the wine loving world knows, Robert Mondavi passed away one year ago May 16th. In an effort to recognize and pay homage to this progressive and influential force in the wine world, Jeff LeFavere from goodgrape.com has chosen a topic for this month’s Wine Blogging Wednesday that invokes Mondavi’s passion for California wines. Jeff’s mission was simple, “revisit a California wine that they have enjoyed, or have a particular fond memory of, and tell a story.” Everyone that knows me knows I love to tell stories, and this topic allows me to do so. I’ll post the video wine review at the end of the post, so please take the time to read the story, and of course, view the video. Before I get into the wine, and my story, I want to take the time to reprint some of Jeff’s original post and comment on that. I thought his post was quite well written, and captured some of my own thoughts and feelings. Jeff writes that “Mondavi was such an inspiration physically, spiritually and philosophically to so many – both in the industry and to consumers, while acting as the forefather of the modern California wine movement” and later goes on to say “Mondavi was a people person, fostering a spirit of goodwill amongst friends new and old while promoting a life well lived that included wine and food as complementary companions on the table and in life.” Quite frankly, that is what I love about wine, that it allows us to bring together friends, new and old, and enjoy time with each other, harmonizing the food and the people at once. 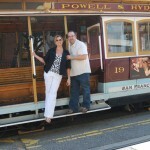 In March of this year, Robin and I took a long weekend and flew out to San Francisco, CA. Robin had never been to San Francisco, and since I was there for training the following week, we decided to tack on a few days and have some fun with it. Coincidentally, it was the 2009 “Wine Road Barrel Tasting” event, so we figured after a day in The Bay, we’d spend two days in Sonoma tasting wines and enjoying life. We have some friends from Twitter who live in the area, so we all planned on meeting Saturday morning for the adventure. Robin and I had a lovely romantic day in San Francisco on Friday, and Saturday morning started our wine journey. Our first stop was the meet Thea (@winebratsf on twitter) and Robbin (@robbin_g) in San Francisco. After picking them up, we drove out to Dry Creek, stopping at Truett Hurst for our first of many tastings. There we hooked up with a bevy of people including Valerie (@winedog), Shana (@Sharayray), John (@DrncPno), Amy (@WineWonkette), Patrick (@Oenophilus), as well as Jim (@sonomawineguy) and probably more I’m forgetting about! We began tasting wines that were just put into the barrels (hence, “Barrel Tasting”), as well as wines that each vineyard had already bottled as current offerings. to 5 or more wineries including Michel-Schlumberger where we met up with MS President & General Manager Judd Wallenbrock (@Humanitas and @M_Schlumberger), where we had a lovely walk through the vineyards and some spectacular private tastings. We capped off Saturday by going to a nice wine bar and doing a Pinot Noir Twitter Taste Live event, complete with live streaming video. Sunday brought us more wine, and more friends. We met up with Liza (@Brixchick_Liza) and continued to tour much of Healdsburg ‘s wineries, tasting rooms, and coops. Robin and I purchased a case of wine from here, and a case of wine from there, selecting what we thought were the stand outs of the visits. The day wore on, and we began to wear out. 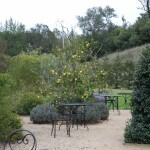 Robin and I were freezing, as a cold and rainy Sonoma Day is not the same as a hot and humid Florida Day. Just as we were about to recommend we head on back to the hotel and call it a day, Thea mentioned that we were to meet Patrick, his wife Genevieve, and their family at Chateau Felice for one last, special tasting. Patrick and Genevieve originally started Chateau Felice, and have since turned it over to their family. The couple have moved on to a new adventure, Iridesse Wines, and they’re going to do great things there. 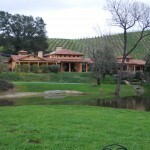 Driving up to Chateau Felice, on Chalk Hill Road, took about 20 minutes from our last winery. However, as soon as we approached the gates to the Chateau, we were all glad we made the trip. A beautiful gate opened up to a sprawling estate with fantastic landscaping and property. We made our way around the water to a barn, which was the tasting room. There we were able to sample some of the future offerings from the barrels, as well as some finished product. We met Barry & Phyllis Rodgers, vintners and proprietors of Chateau Felice. A lovely couple with outgoing personalities, they welcomed us to their home and their passion. We listened as they told us about the wine, the estate, and the future. Barry poured us wonderful barrel samples, and tempted us with futures. Unfortunately, Robin and I had met our quota on wine purchases, and avoided those temptations. We were not, however, as diligent with the current releases. We next met Barry and Phyllis’ daughter Samantha Rodgers-Daniel, director of Sales & Marketing. She was pouring the current releases, and gave us a fabulous tour of all of the wines Chateau Felice had available for sale. We had the opportunity to taste 6 different wines, each more lovely than the last. And here is where we go back to what Robert Mondavi and Jeff’s theme is all about. The people and the event made this wine moment memorable. 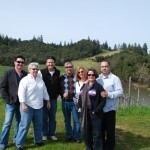 It was more than just Robin & I in a wonderful place for the first time, enjoying each other and our passion for wine. It was more than just friends enjoying a nice time. It was the harmony made between the people, the location, and the wine that created “a time and a place” worth savoring. We took our time, enjoying each others company. We took our time, enjoying each sip of wine. We took in the beautiful scenery, despite the cold and the rain. We savored our experience. 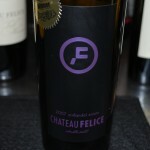 And Robin and I bought a mixed case of Chateau Felice wines to relive that experience again, and again. The wine we selected to relive these fond memories was the Chateau Felice Black Label Zinfandel 2007. We selected this wine tonight because not only was it one of our favorite Zinfandel’s from the weekend’s tastings, but because we knew it would go nicely with our dinner of homemade lazagna. I’ll let the video speak for itself in terms of what the wine has to offer, and leave this wine blog post with it’s mission in tact. I selected a wine that invoked fond memories. And now, I have the blog post, and video, to relive them again, and again. I will, as the video said I would, discuss how the wine paired with the meal. I’m going to be making a conscious effort to discuss food and wine pairings in each of my wine reviews and wine blog posts, as many of my friends have asked for this information. Between the live tastings, twitter taste live events, and my own tastings, I’ve been able to taste a variety of wine with an array of foods, and I want to discuss and share this knowledge. As the flavors from the lasagna, the sauce, cheeses and pasta, coated the palate the wine transformed. The Chateau Felice Zinfandel morphed from the bright fruit discussed in the video to this dark and deep wine. There was certainly a coffee and cocoa component on the finish that was very enjoyable. Much of the zip and pepper was smoothed out, and the mouth feel was much more elegant with food. It was a great pairing, and I’m sure you’d enjoy it as well. AS always, thank you to Lenn Thompson for helping the wine blogging community stay strong and focused, at least once per month! We appreciate the effort you took, and take, to keep Wine Blogging Wednesday going.